Gitajanli Devakul established in April 2014, is proud to be associated with one of the world’s leading curriculum – CBSE which is designed to develop core Democratic values and facilitate holistic development of the children. It emphasizes activity based learning and conceptual understanding through inquiry, experimentation and validation. Co-Scholastic activities were introduced under the CCE framework, since 2006 with an objective of updating the standards of CBSE to be at par with other leading curricula. This was a giant step towards achieving global standards. It brings in the age-old concept of putting multiple intelligences into practice. Ever since, students of the CBSE curriculum have redefined the term intelligence by showcasing their potential in various fields such as sports, performing arts, and literary skills. It goes without saying that this has been a refreshing and a much awaited change from the traditional knowledge based and exam oriented learning. It has also changed the conventional mind set of both the students and the parents and has paved way for diverse career choices of students which have now become increasingly driven by passion rather than compulsion. We, at Gitanjali Devakul, are striving to update ourselves with the latest developments by diligently following the guidelines of CBSE from time to time, simultaneously incorporating novelty and creativity that sets our school apart from the rest. We are introducing more science related activities, community work and hobbies in the next academic year along with music, dance and visual arts. These activities build team spirit, confidence and equip students with necessary life skills that enable them to become responsible and resourceful citizens of India. All learning would go unrecognized without proper qualitative and quantitative assessments. CBSE’s Continuous and Comprehensive Evaluation system enables us as educators, to use it for monitoring and supporting students’ progress. It facilitates timely intervention and remediation. Our teachers are well trained in the CCE system and they have been giving in their best in mentoring the students and enabling them attain their true potential. Gitanjali Devakul has successfully completed two years on this path towards perfection. This is possible because of the able guidance and support from the Management, Gitanjali Group of Schools, Begumpet and the relentless contribution of our dedicated, dynamic and enterprising team of teachers. In this long journey, there are many avenues to explore many more successes and experiences to be cherished and innumerable milestones to cross. Team work is our strength, never give up is our attitude and Perfection is our pursuit. - To Participate In Extra Curricular Activities And Community Work. “Education is not the learning of facts, but the training of the mind to think". 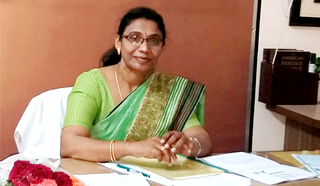 As the Principal of Gitanjali Devakul, I feel privileged to be a part of an educational institution where every child is given an opportunity to learn and to discover. The world today is changing at such an accelerated rate and we as educators need to pause and reflect on this entire System of Education. Today, the role of a school is not only to pursue academic excellence but also to motivate and empower its students to be life long learners, critical thinkers and productive members of an ever changing global society. This can only be possible in a holistic and student-centric environment. In this context, Gitanjali Devakul's curriculum and practices are consistently reviewed to ensure that the children who walk into the portals of our school will not just love their school years but are also fully equipped with the right and the necessary knowledge required to lead a successful life. While academic excellence is our major thrust, the school is also devoted to prepare the students for their future, groom them to face the challenges of tomorrow and encourage them to be socially relevant. We constantly endeavour to always live up to this ideology and inculcate this into everything we do.